Use the filters below to browse booklets by language and topic. Use this calendar as an easy way for you and your family to manage medications and doctor’s instructions. 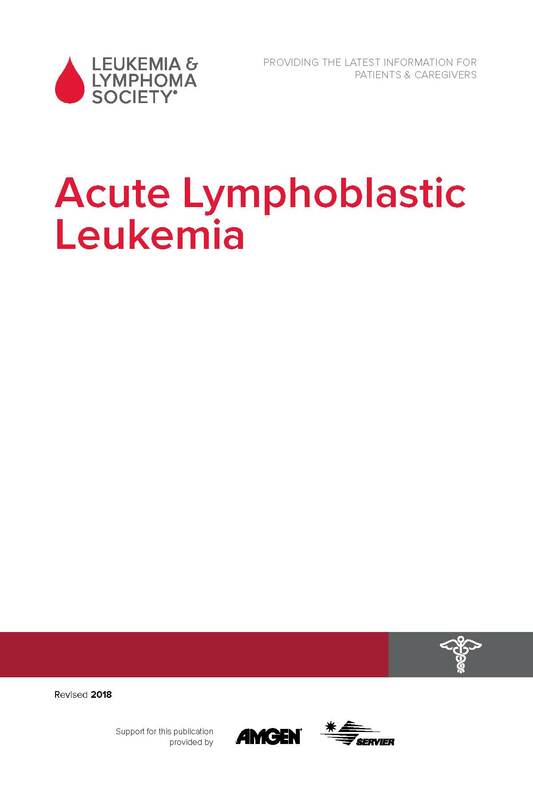 This booklet provides information about acute lymphoblastic leukemia (ALL) for patients and their families. This booklet provides information about acute myeloid leukemia (AML) for patients and their families. 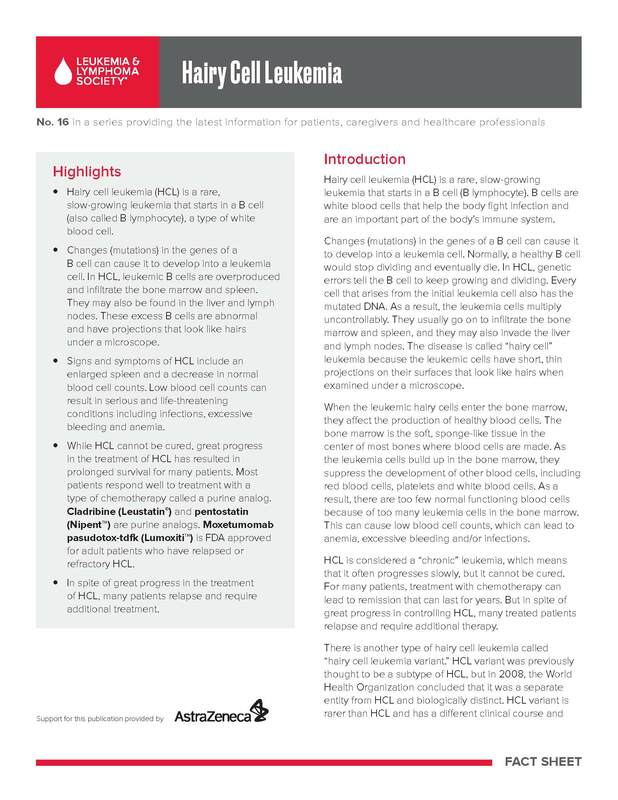 This fact sheet provides information about acute promyelocytic leukemia (APL), which is a unique subtype of acute myeloid leukemia (AML). This is currently out of stock. Please check back soon to order a copy. The LLS Office of Public Policy partners with patients, family members, and healthcare providers across the country to advocate for legislation and policies that help blood cancer patients live longer, better lives. This booklet is for patients with ALL, their families and caregivers. 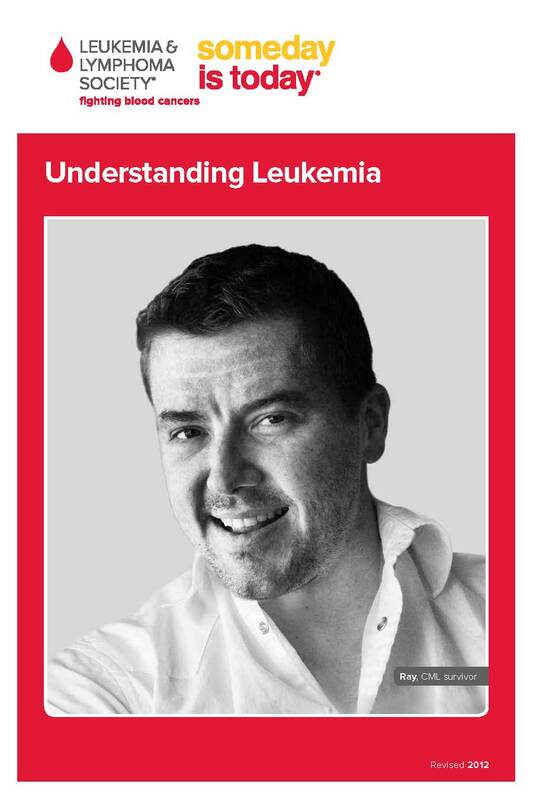 The AML Guide is for people with AML and others who want basic information about the disease. Available in PDF format only. 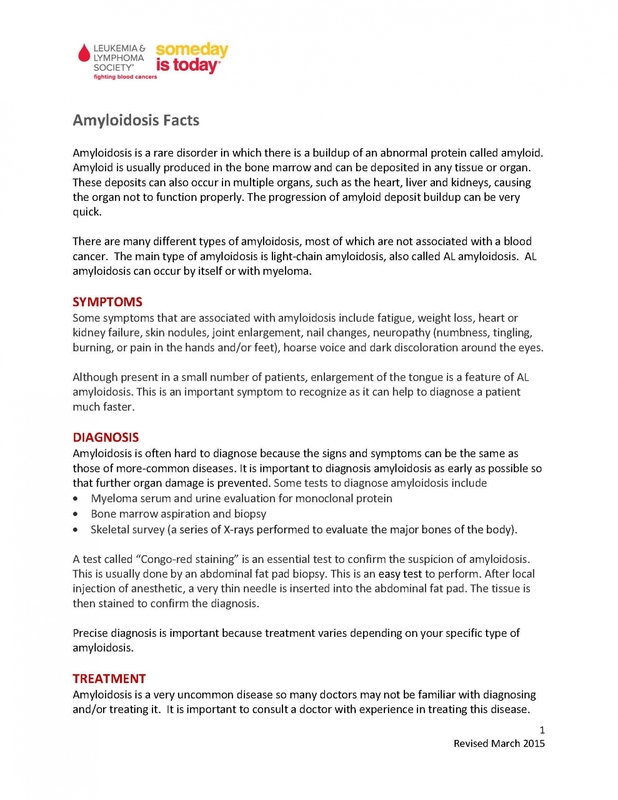 Amyloidosis is a rare disorder in which there is a buildup of an abnormal protein called amyloid.This PDF contains information about symptoms, diagnosis and treatment for amyloidosis. 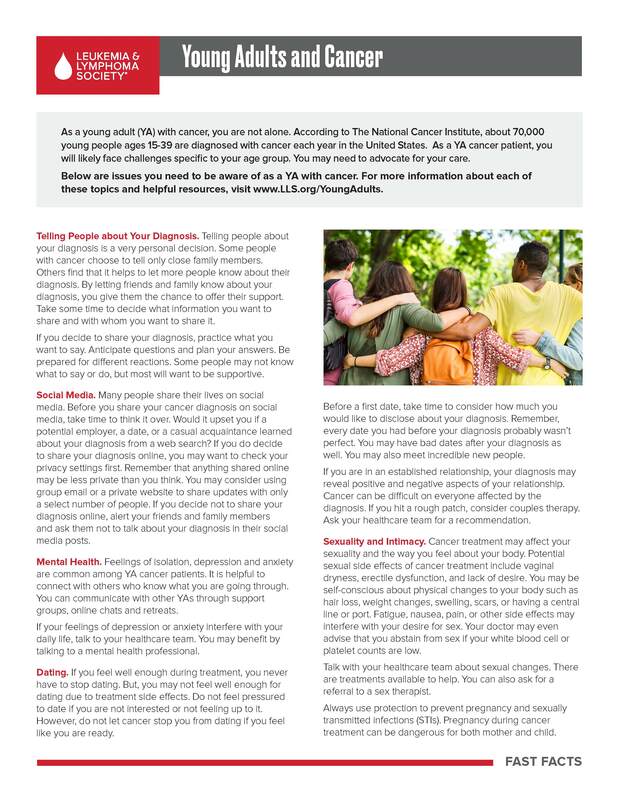 This two-sided palm cards provides LLS resources which can help manage the education needs of children and young adults who have been diagnosed with cancer. 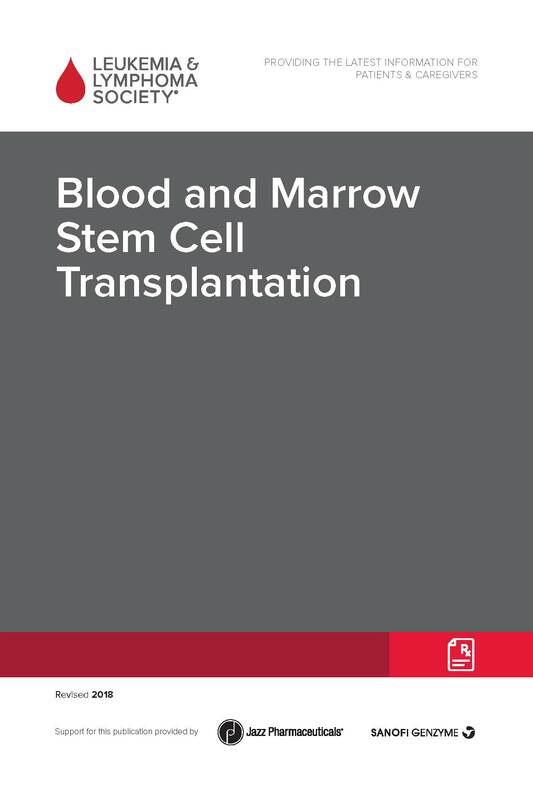 This booklet provides information about blood and marrow stem cell transplantation for the treatment of blood cancers. This easy-to-understand guide will provide you with basic information about stem cell transplantation. 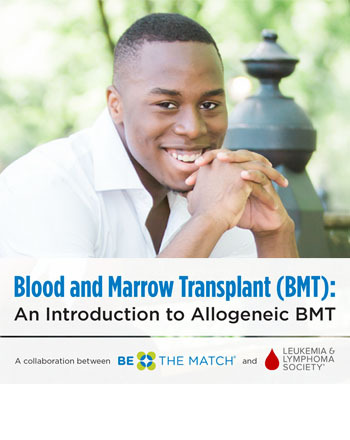 This book was produced in collaboration with Be The Match®. Two-sided color chart with information about blood cells and the lymphatic system that can be used by healthcare professionals as a patient education tool. 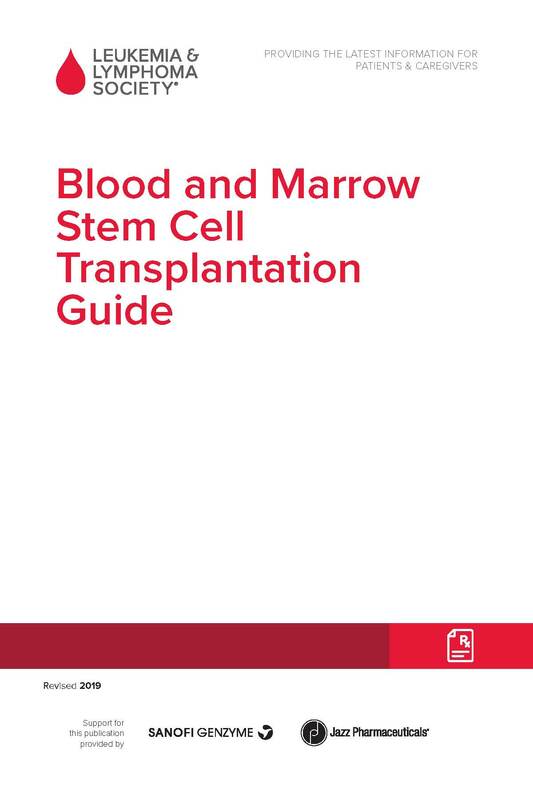 This booklet provides information about blood transfusion and answers blood cancer patients' frequently asked questions. 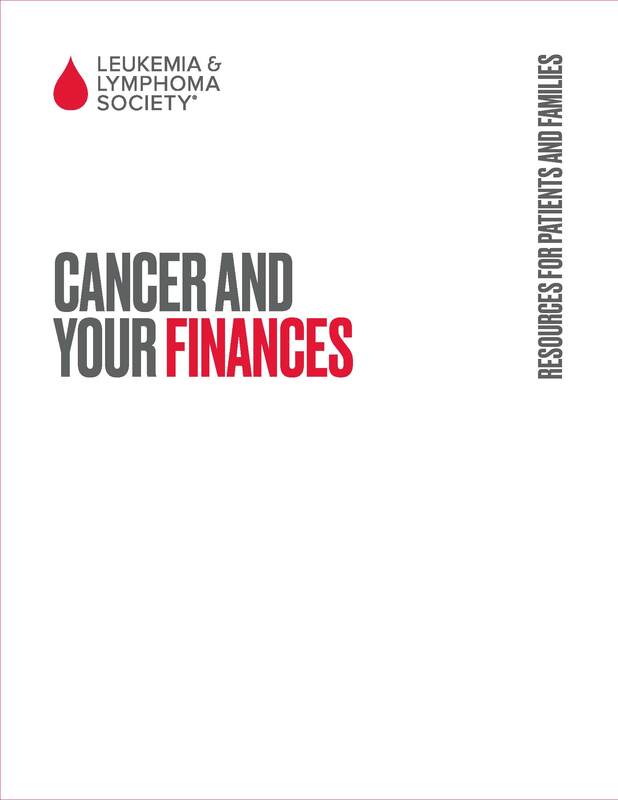 This booklet describes health insurance options and resources to help patients and their families who are coping with the financial aspects of cancer care, and includes worksheets to help you stay organized. 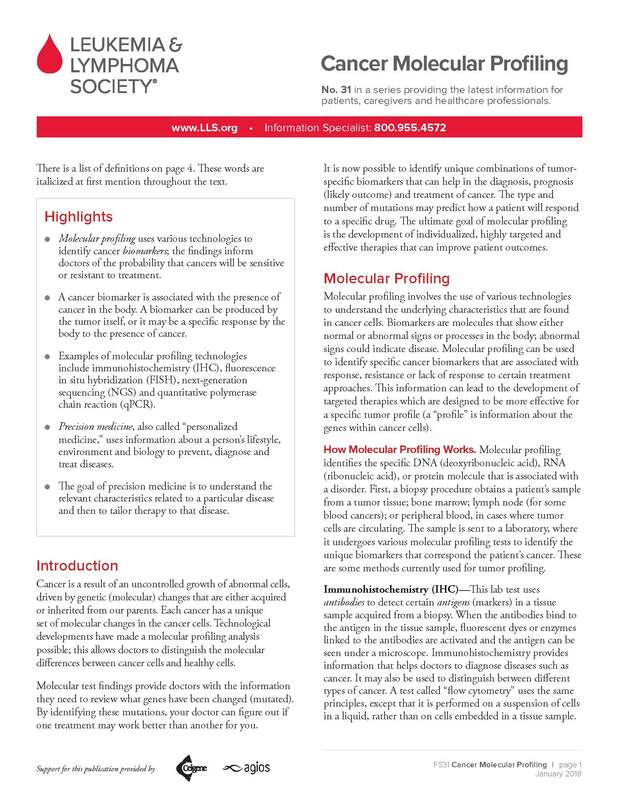 This fact sheet provides information about molecular profiling, which allows doctors to identify gene mutations and figure out if one treatment may work better than another. This fact sheet addresses some common questions that people may have about cancer-related fatigue. One-page description of how the CAR T-cell therapy process works. Information about preparing the home, protecting a weakened immune system, cleaning and more. 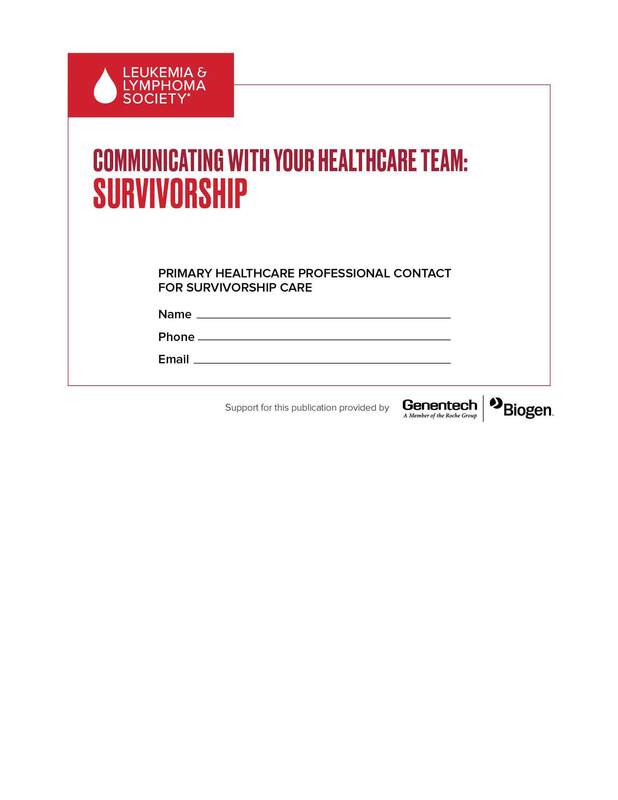 Caregivers may order a copy of the full workbook by calling (800) 955-4572. Includes information about creating a self-care plan, support for caregiver, and more. This fact sheet provides information about chimeric antigen receptor (CAR) T-cell therapy, which is a type of immunotherapy. 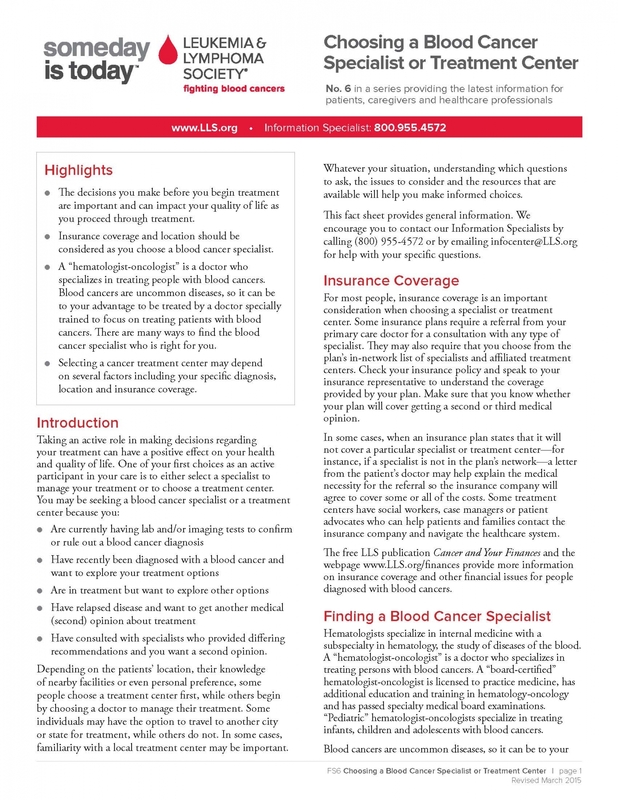 This fact sheet provides general information about choosing a blood cancer specialist or treatment center. 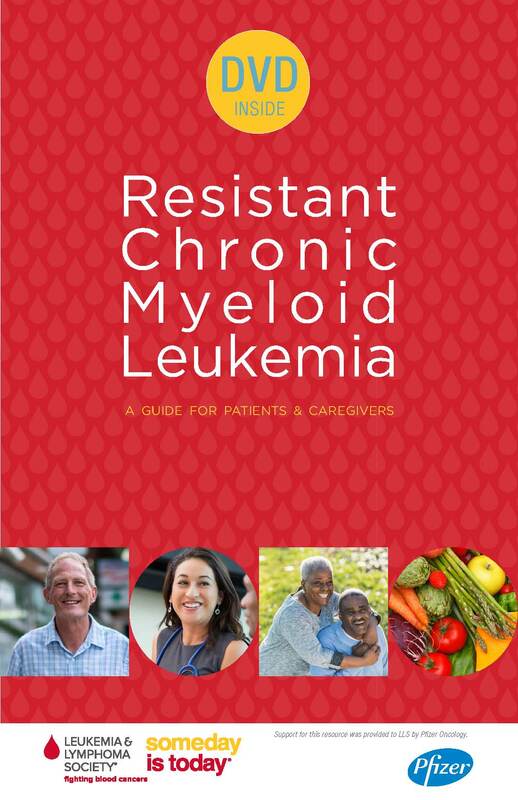 This booklet provides information about chronic lymphocytic leukemia (CLL) for patients and their families. 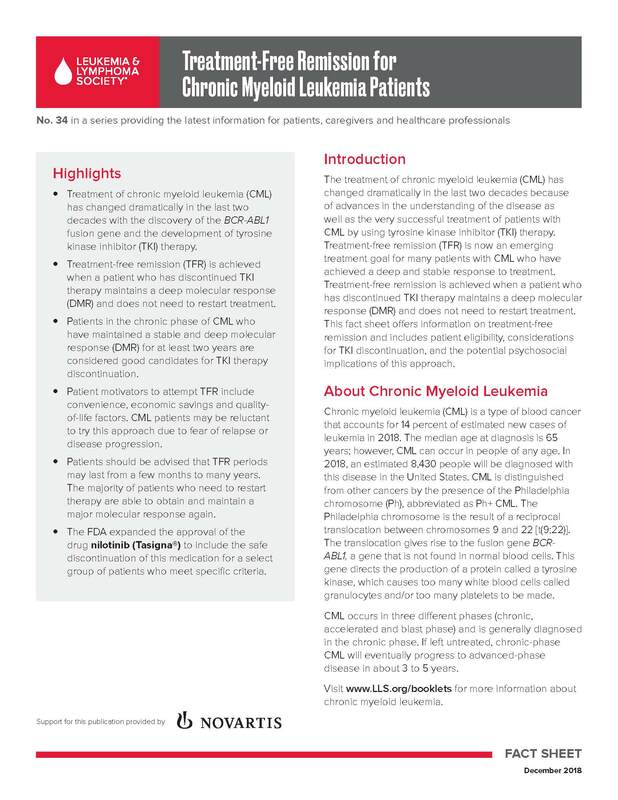 This booklet provides information about chronic myeloid leukemia (CML) for people who have CML and their families. This fact sheet provides information about CMML and JMML diagnosis, treatment, clinical trials and support resources. 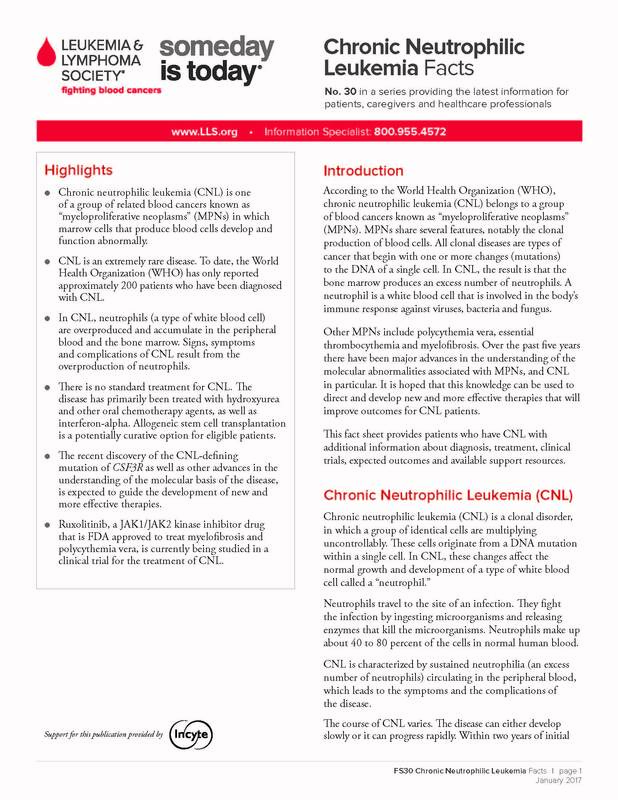 This fact sheet provides information about diagnosis, treatment, expected outcomes and available support resources for chronic neutrophilic leukemia (CNL). Bookmark outlining the Clinical Trial Support Center (CTSC) process for supporting patients. 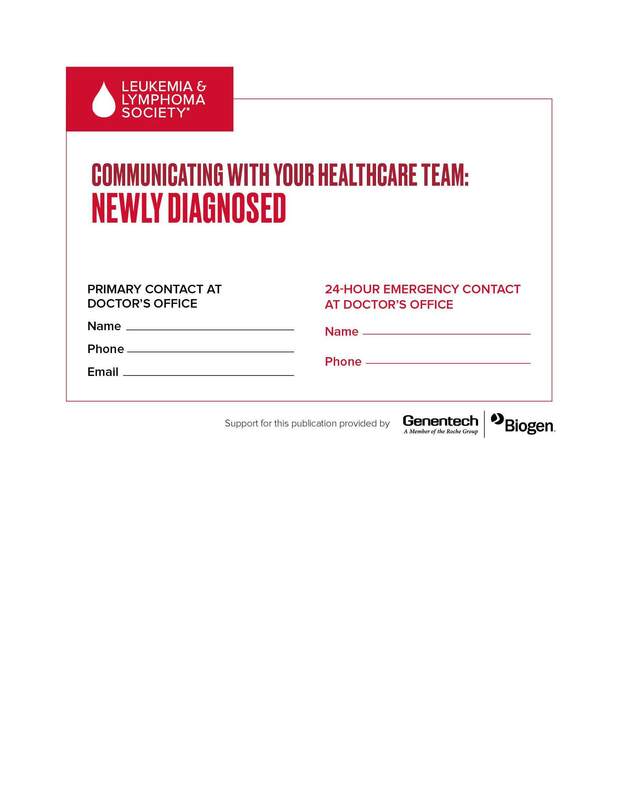 This booklet is for people with chronic lymphocytic leukemia and others who want basic information about the disease. This booklet is for people with chronic myeloid leukemia and others who want basic information about the disease. 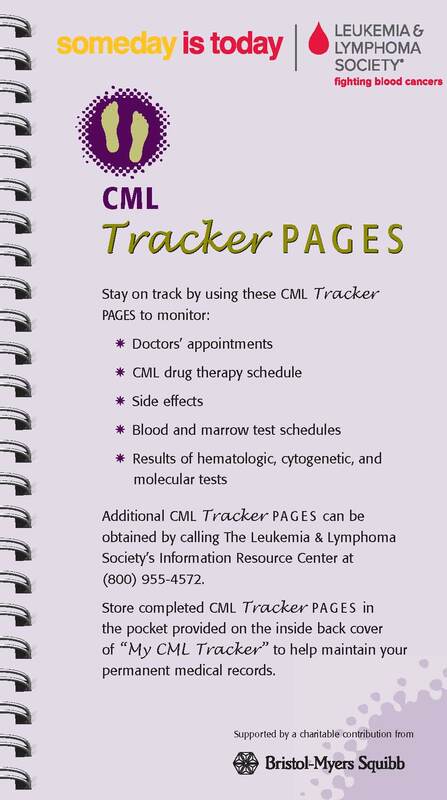 Available in PDF format only.Stay on track by using these CML Tracker PAGES to monitor doctors' appointments, test results and more. This two-sided bilingual card includes information about LLS's Co-Pay Assistance Program and how to apply. Information and tips for communication and long-distance caregiving. Many factors can affect a treatment choice. Weigh your treatment options carefully and talk through each option with your healthcare team. A companion card to the full version. For a cancer patient, being able to talk openly and honestly with your healthcare team is very important. Good communication helps you receive the best care. 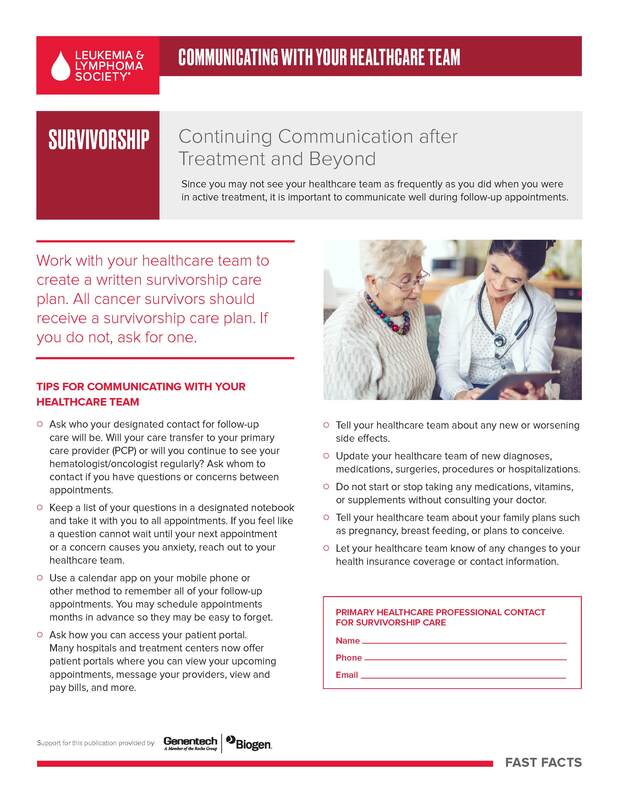 All cancer survivors should receive a survivorship care plan. If you do not, ask for one. 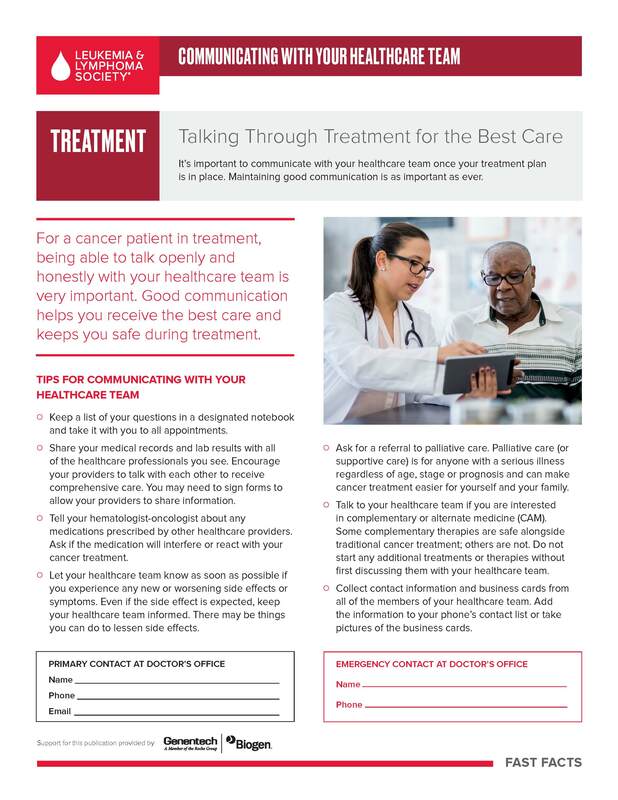 It’s important to communicate with your healthcare team once your treatment plan is in place. Maintaining good communication is as important as ever. Children with leukemia or lymphoma may face long periods of treatment. However, most can expect to have full and productive lives. Many childhood cancer survivors return to school, attend college, enter the workforce, marry and become parents. Still, each family living with a childhood cancer diagnosis is thrown into an unfamiliar world. 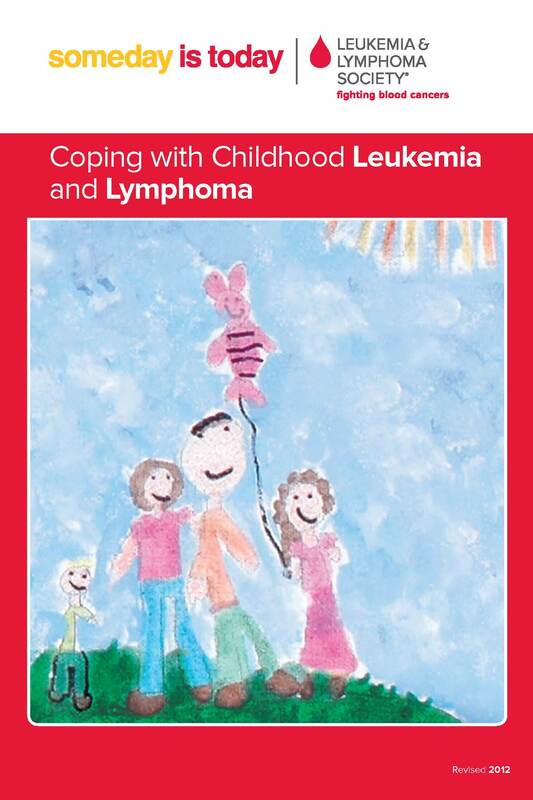 Coping With Childhood Leukemia and Lymphoma is for families who are dealing with this difficult circumstance. 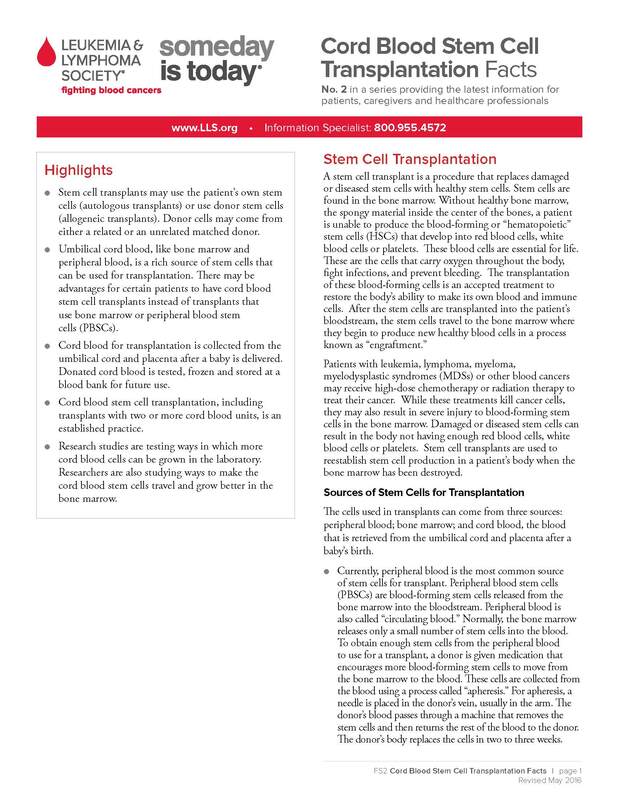 This fact sheet discusses why using cord blood for stem cell transplantation may be an option for some blood cancer patients. 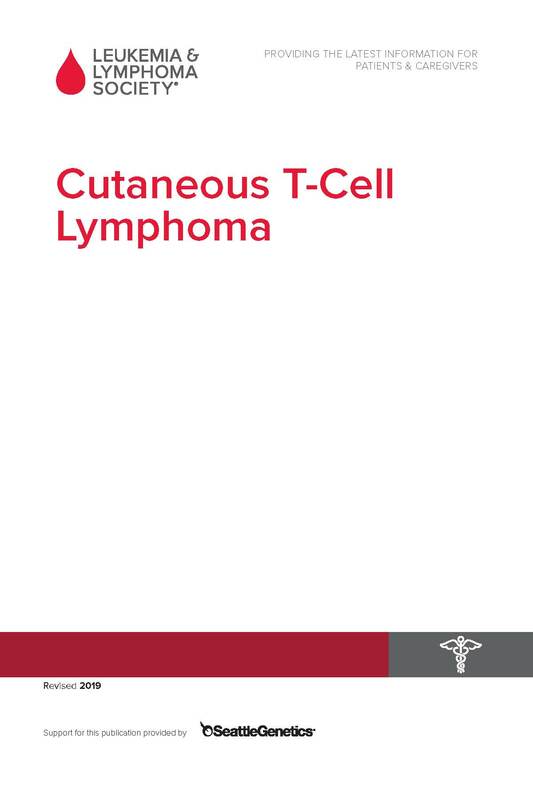 This booklet provides information about cutaneous T-cell lymphomas (CTCL), relatively uncommon types of non-Hodgkin lymphomas. 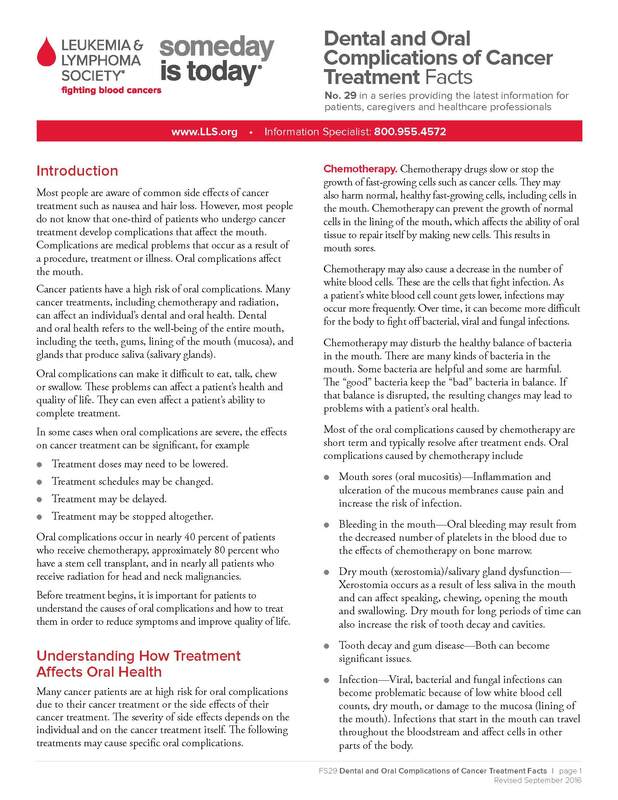 This fact sheet can help you understand the dental and oral complications of cancer treatment, and what you should do before and during treatment. This booklet can help you identify what you need to know and do to cope with your diagnosis, treatment and recovery. Information about transitioning into survivorship, end-of-life care, hospice and bereavement. Facts 2017-2018 is an update of data available for blood cancers. FOR HEALTHCARE PROFESSIONALS: The latest information for healthcare professionals about BPDCN. FOR HEALTHCARE PROFESSIONALS: The latest information for healthcare professionals about chimeric antigen receptor (CAR) T-cell therapy. This fact sheet can help you understand how blood cancers and treatment for blood cancers can affect fertility. Information about balancing work, FMLA, health insurance, financial assistance and more. Firefighters are at an increased risk of developing cancer and there are steps to take that can reduce that risk. Share this postcard to help raise awareness. This fact sheet discusses how eating well helps people living with cancer to feel better and stay stronger. Available as PDF only. Palm card flyer listing the latest free resources for you and your patients. 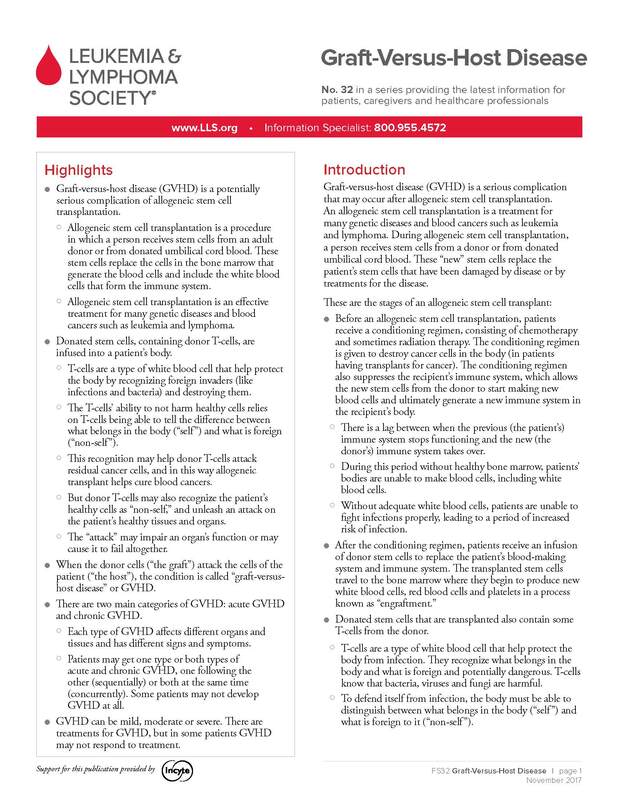 This fact sheet provides information about graft-versus-host disease (GVHD). This fact sheet provides information about hairy cell leukemia, including treatment, clinical trials and support resources. 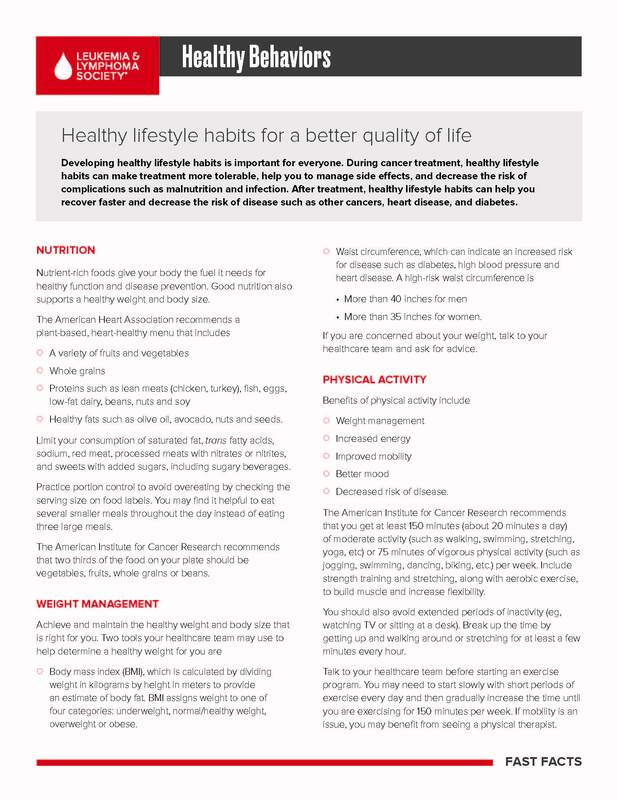 During cancer treatment, healthy lifestyle habits can make treatment more tolerable, help you to manage side effects, and decrease the risk of complications. The Leukemia & Lymphoma Society (LLS) offers financial assistance to help individuals with blood cancer. 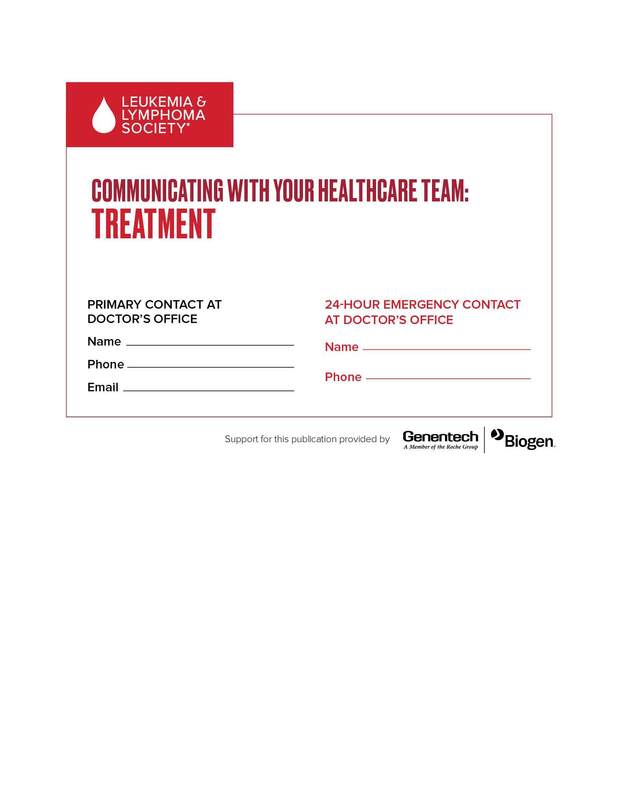 This bilingual brochure describes the resources and support that LLS offers to patients and caregivers affected by blood cancers. 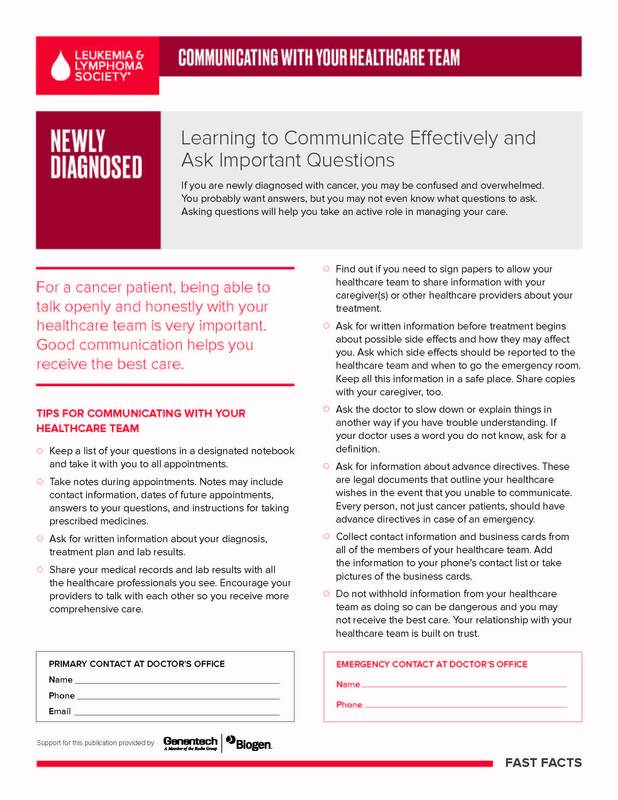 This booklet provides information for Hodgkin lymphoma patients, their families and caregivers. This fact sheet gives an overview of several types of immunotherapy and their role in the treatment of blood cancer. This fact sheet provides an overview of how CAM therapies are being incorporated into blood cancer treatment plans. Information about what caregiving looks like, and strategies for caregiving. 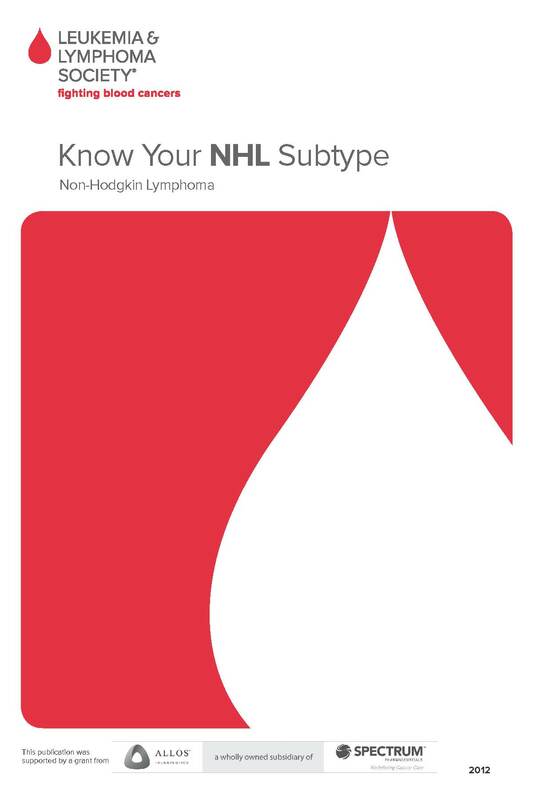 This brochure will help patients make the connection between knowing their specific NHL subtype and getting the best available treatment. 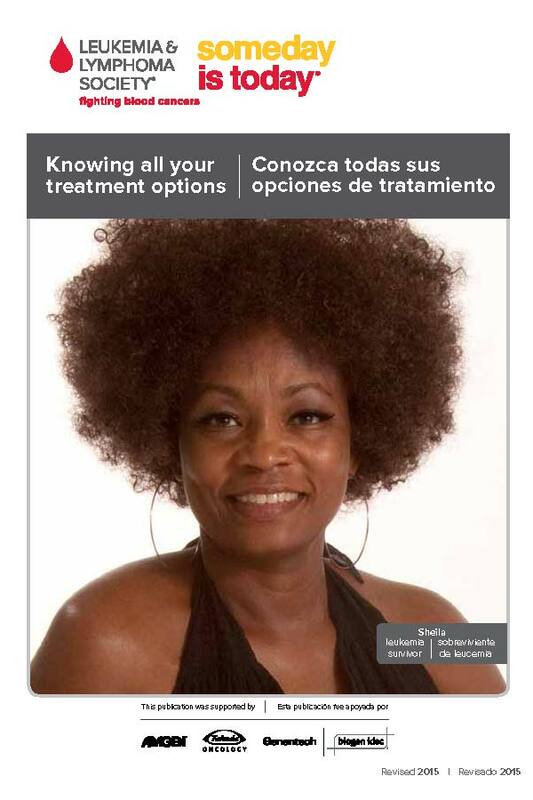 This bilingual English/Spanish booklet provides information to help you talk with your doctor about all your treatment options. 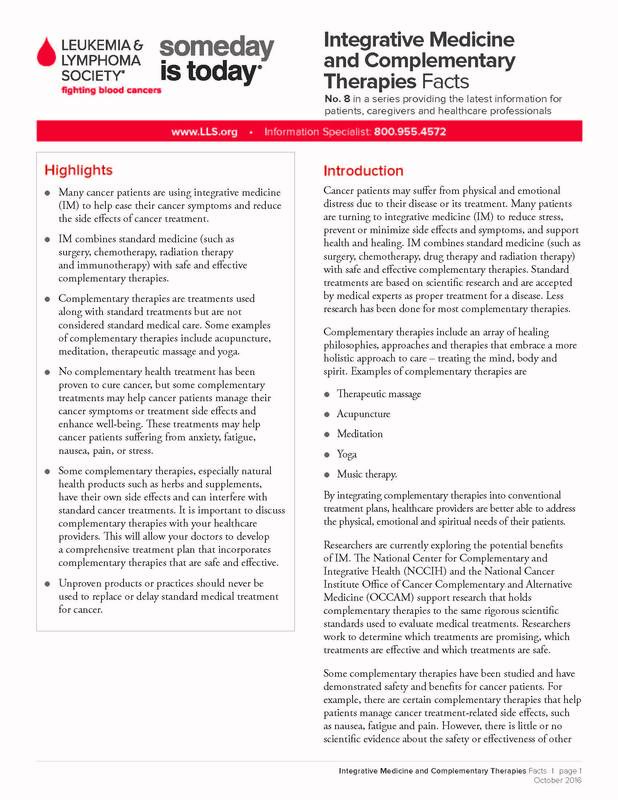 This booklet is written to guide your child's return to school after a cancer diagnosis and help you develop an education plan. This fact sheet can help you understand long-term and late effects of childhood blood cancers and provides guidance and resources for dealing with these treatment effects. 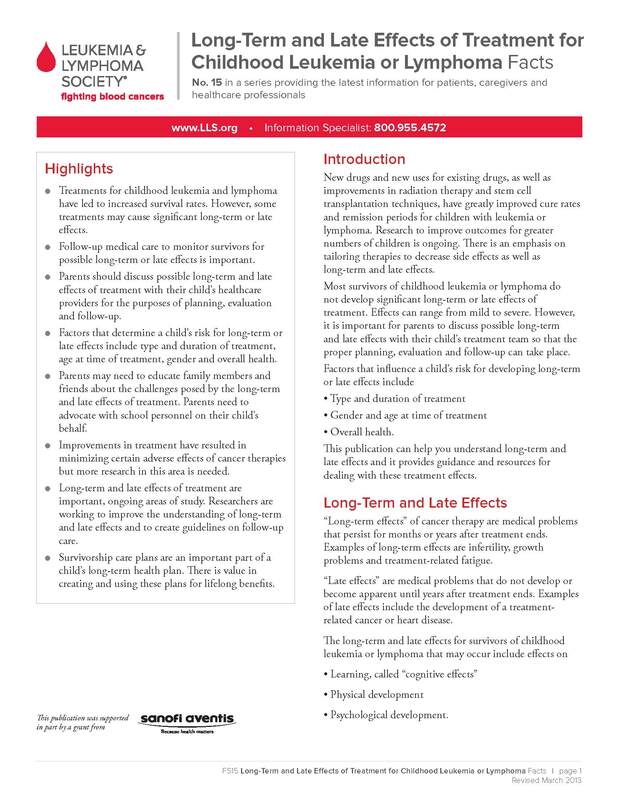 This fact sheet discusses long-term and late effects of treatment in adults and how to recognize and manage them. This booklet has sections with information for Hodgkin lymphoma and for non-Hodgkin lymphoma. 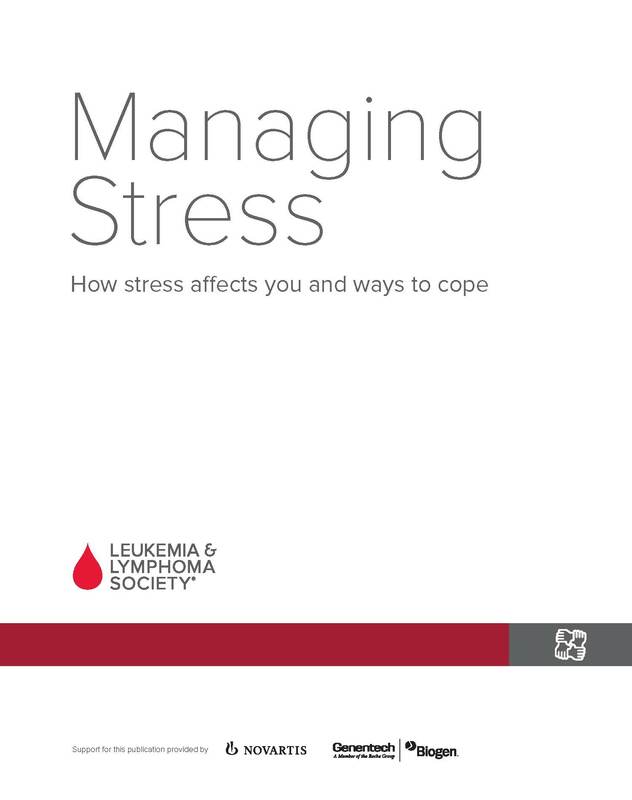 Information about how stress affects you and tips for stress management. 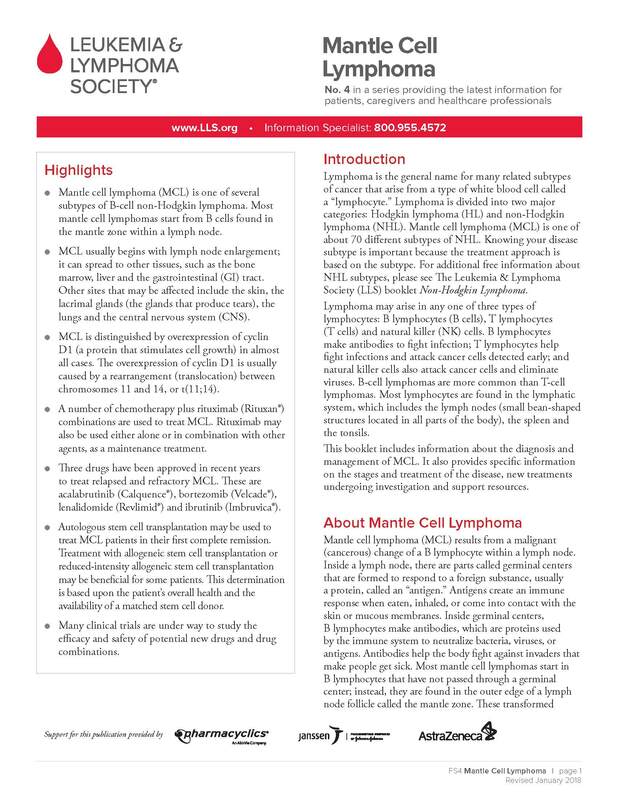 This fact sheet provides information about the diagnosis and management of mantle cell lymphoma. 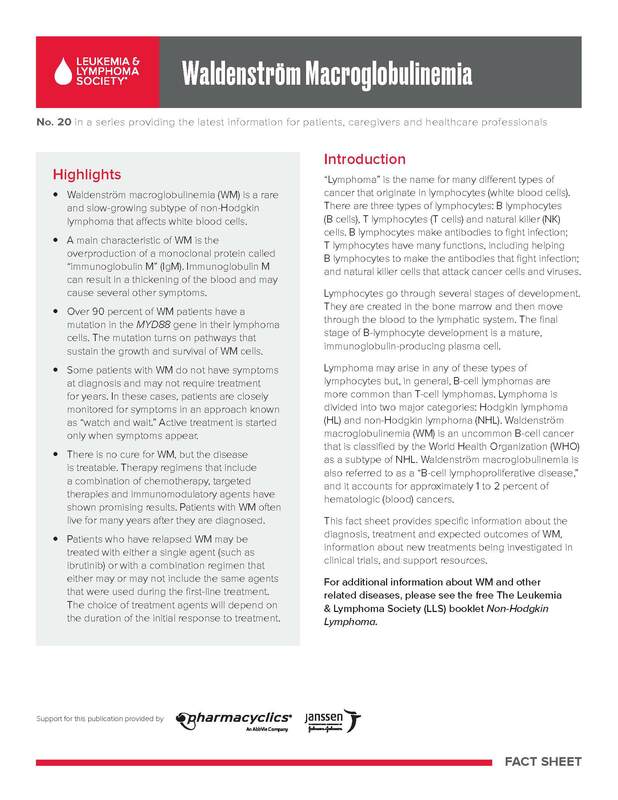 This booklet provides basic information about myelodysplastic syndromes (MDS) for patients and their families. Available in PDF format only. 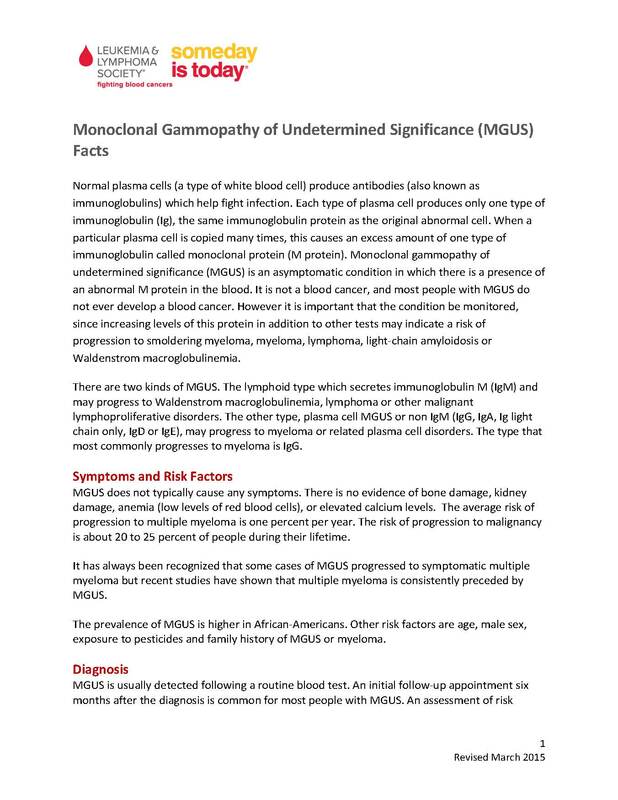 MGUS is an asymptomatic condition in which there is a presence of an abnormal M protein in the blood. This PDF contains information about risk factors, diagnosis, smoldering myeloma, and more. This booklet provides detailed information about myelodysplastic syndromes (MDS) for patients and their families. This booklet provides information about myeloma for patients and their families. This booklet is for people with myeloma and others who want basic information. 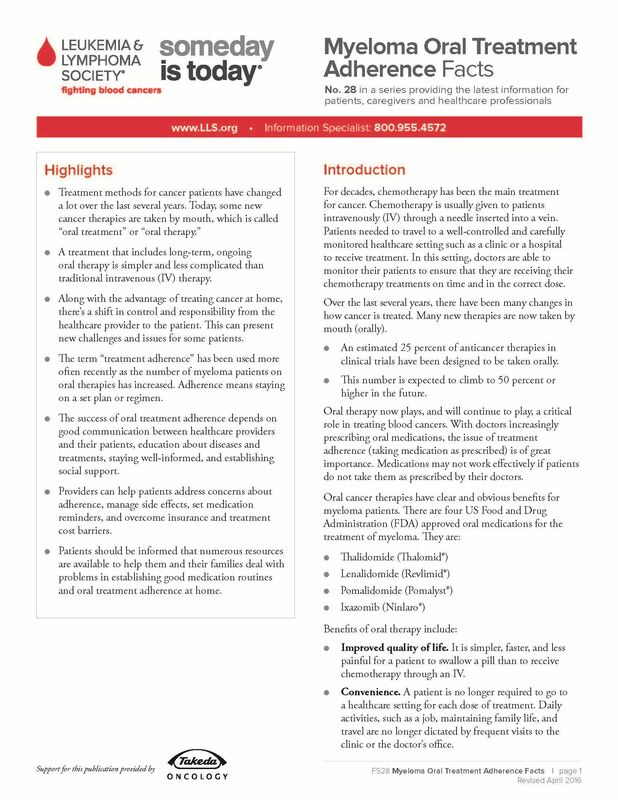 This fact sheet provides information about myeloma oral treatment adherence, including tips and resources to help you remember to take your medications. 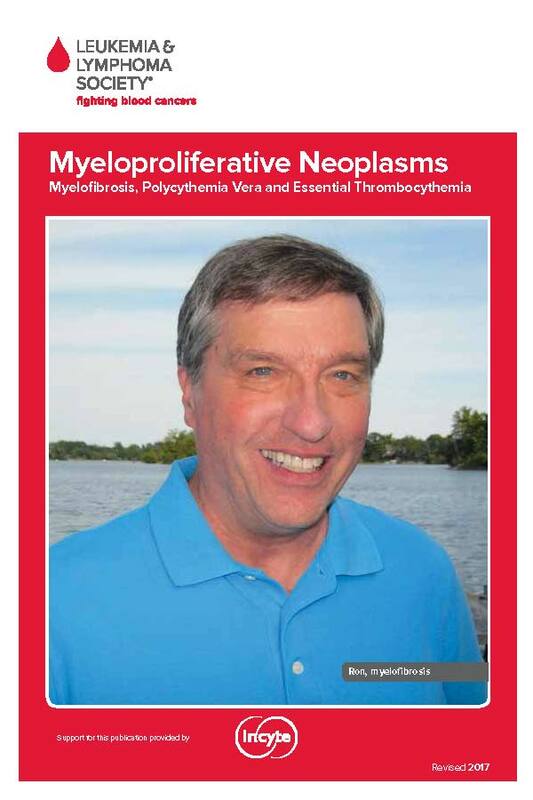 This booklet provides information about myeloproliferative neoplasms (myelofibrosis, polycythemia vera and essential thrombocythemia). This booklet provides information about the more common types of non-Hodgkin lymphoma for patients and their families. 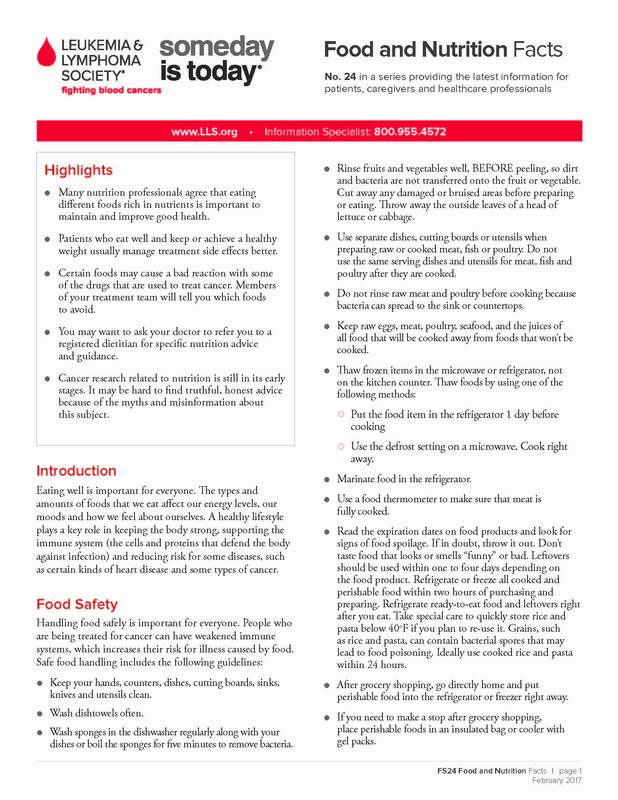 Information about nutrition, food safety, tips and more. 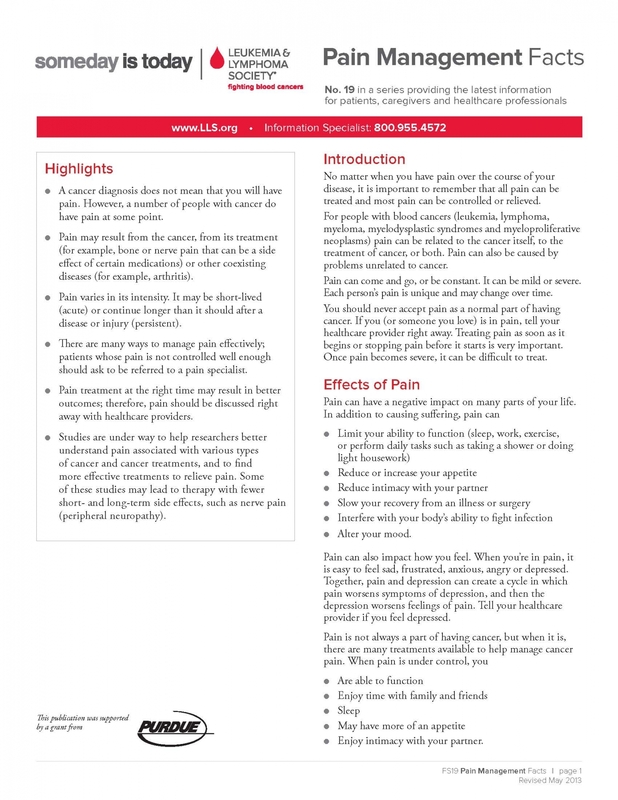 This fact sheet provides information about pain management. 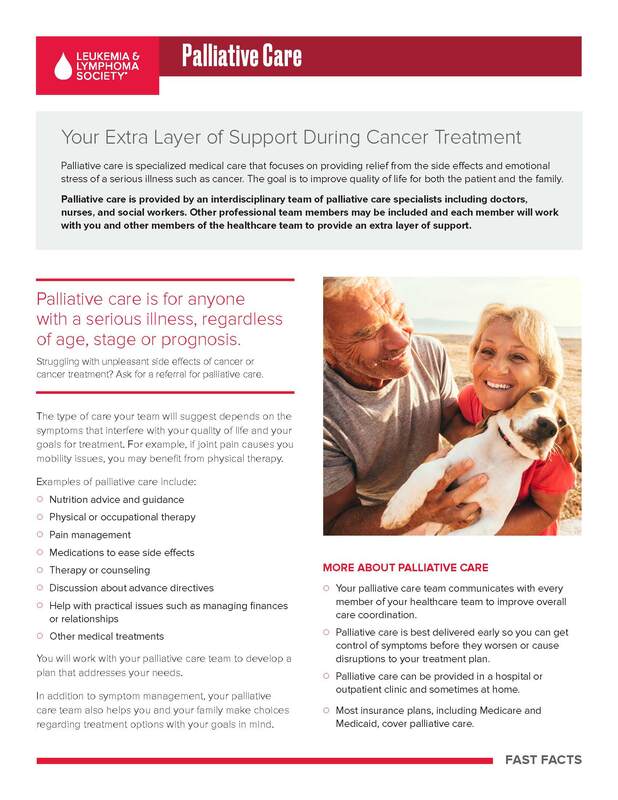 Two-page information sheet about palliative care, which can help you maintain a better quality of life during and after cancer treatment. 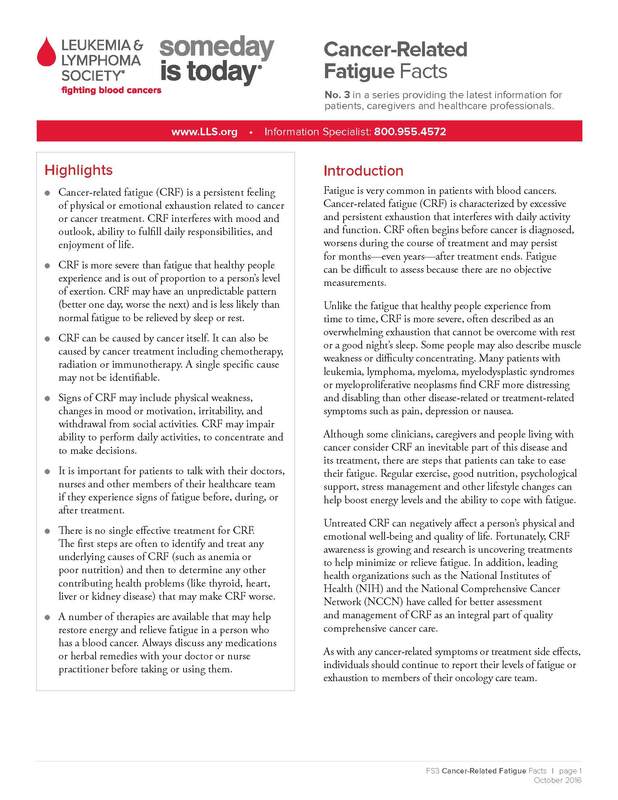 This brochure describes LLS's Patti Robinson Kaufmann First Connection Program where patients connect with a trained volunteer. 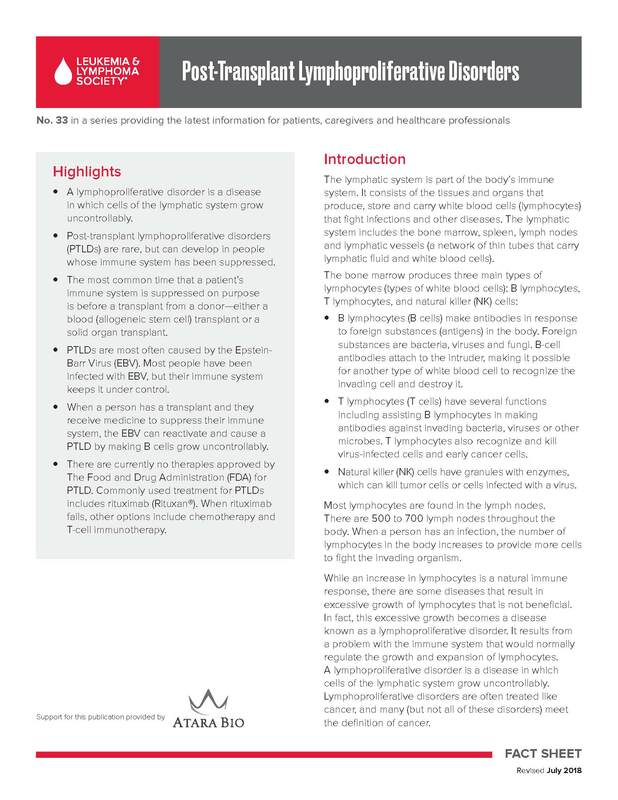 This fact sheet provides information about the diagnosis, stages and treatment of peripheral T-cell lymphomas. Get a free one-on-one nutrition consultation with a registered dietitian with expertise in oncology nutrition. This bilingual English/Spanish palm card includes information about LLS's Information Specialists. 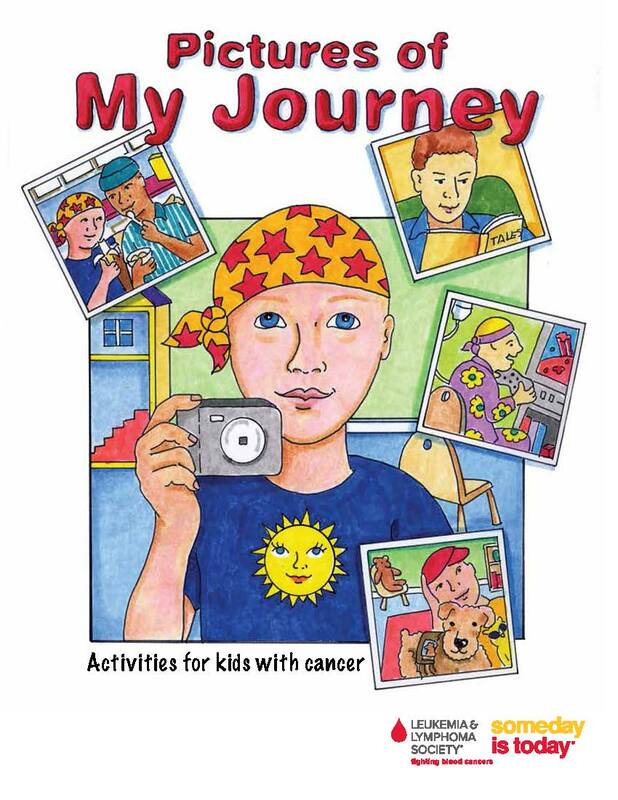 This activity book for kids with cancer can help children cope with their cancer experiences. Includes crayons. This fact sheet provides information about PTLDs, which are diseases in which cells of the lymphatic system grow uncontrollably after a solid organ or stem cell transplant. This booklet and DVD provide information for people who have CML that is resistant or intolerant to treatment. 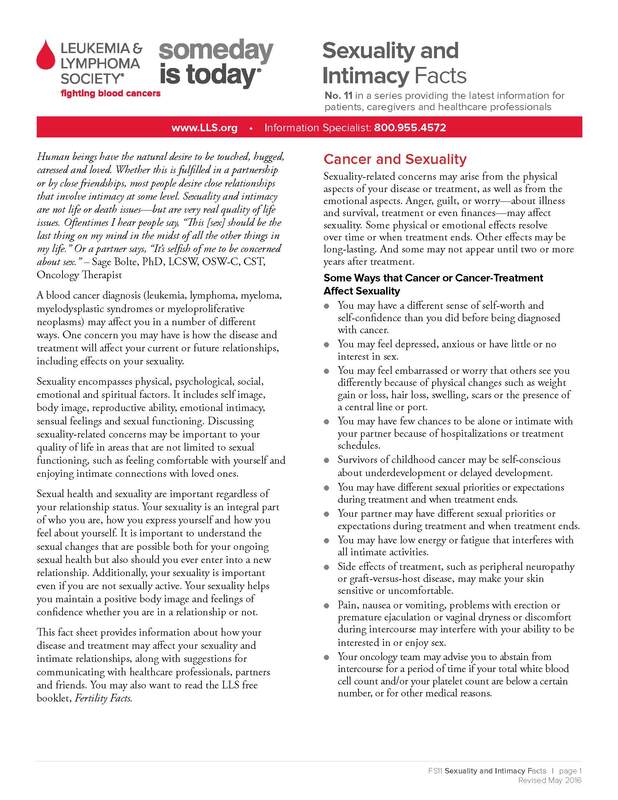 This fact sheet provides information about how your disease and treatment may affect your sexuality and intimate relationships. 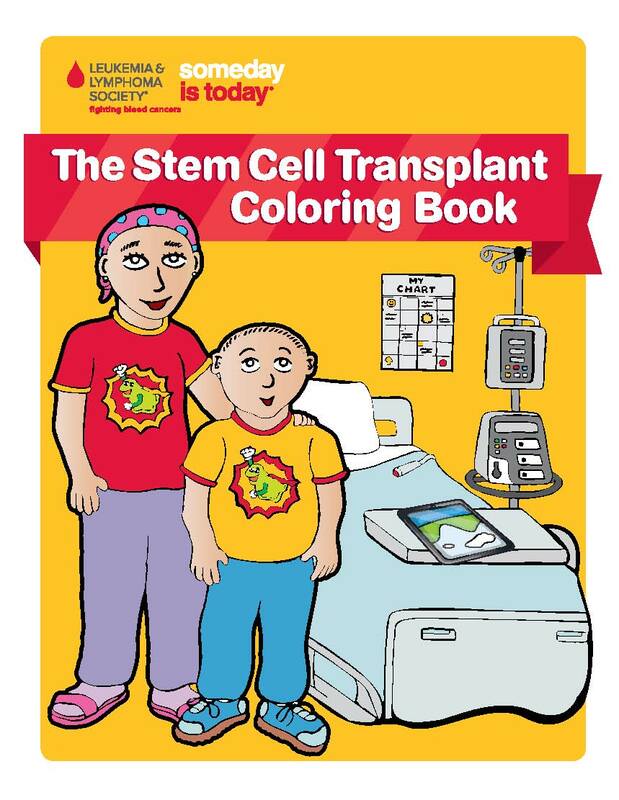 The Stem Cell Transplant Coloring Book is for children with blood cancer who are coping with having a stem cell transplant. Includes crayons. Treatment-free remission (TFR) is achieved when a patient who has discontinued TKI therapy maintains a deep molecular response (DMR) and does not need to restart treatment. Information about blood cancer treatments and the caregiver's role in each. 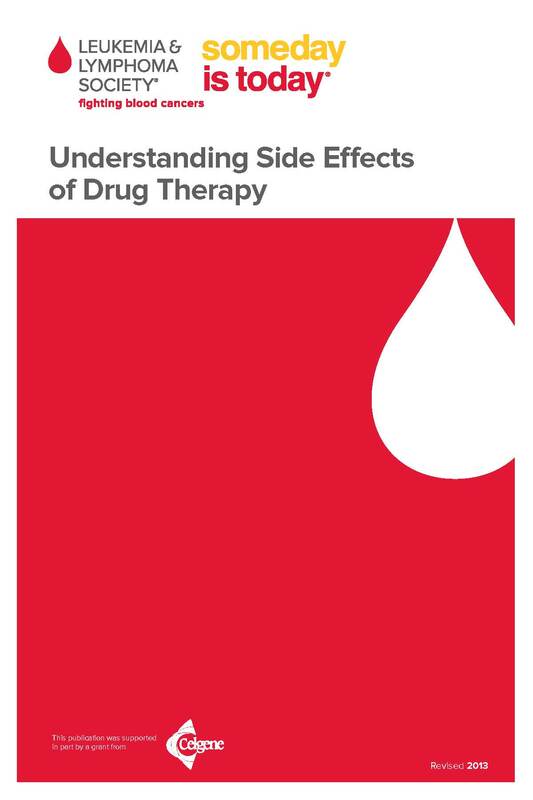 This booklet will help you to decide if a clinical trial is right for you. This is currently out of stock. Check back soon to order a copy. This booklet describes a number of diagnostic and monitoring tests and what to expect. This booklet is for anyone interested in learning more about leukemia. It explains the four main types of leukemia, how leukemia is diagnosed, general methods of treatment and how The Leukemia & Lymphoma Society can help. 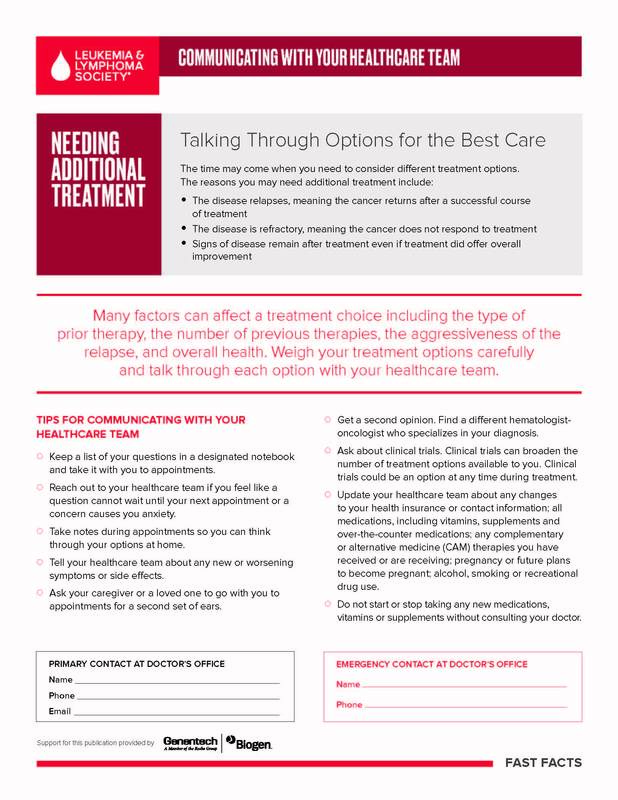 This booklet provides questions to ask your healthcare team and lists common side effects and their management. 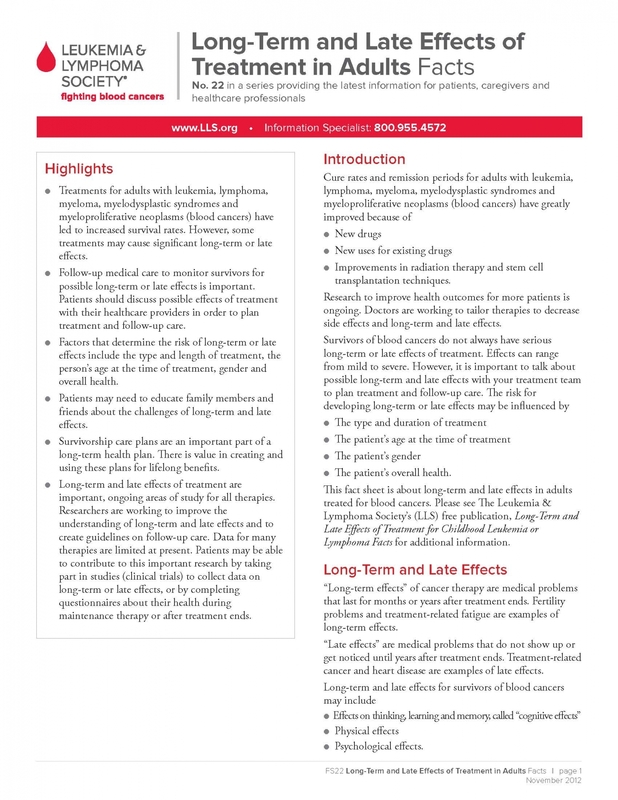 This fact sheet provides information about diagnosis, treatment and expected outcomes for Waldenström macroglobulinemia. 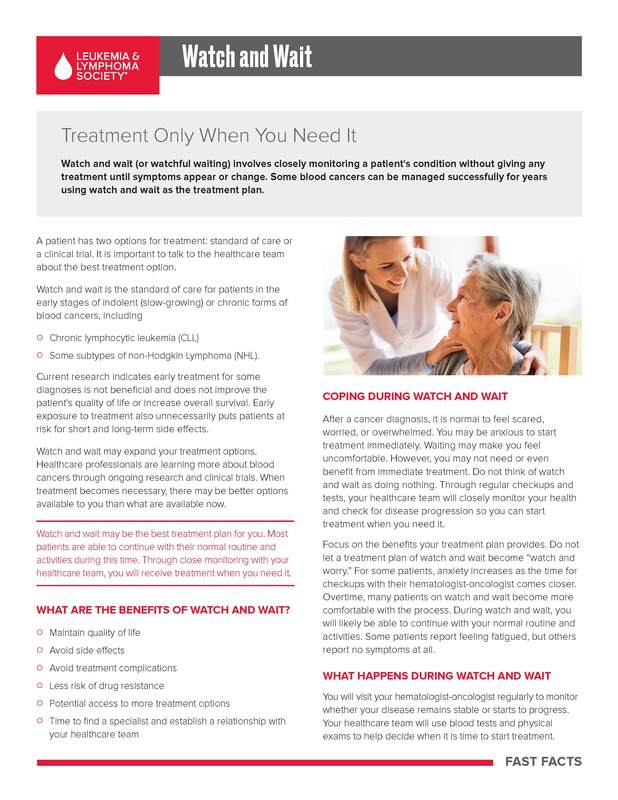 Two-page information sheet about watch and wait, which involves closely monitoring a patient's condition without administering treatment until symptoms appear or change. Information about talking to children about cancer, ways to cope, school, side effects and more. Chart illustrating where blood cancers arise in normal blood cell formation. Information about the issues young adults with cancer need to be aware of.